Image credit: The Gambrinus Company. Just in time for the holidays, the latest little white box from the little brewery in Shiner arrived at my door on the afternoon of Christmas Eve. Inside it, nestled neatly among strands of green and gold confetti, was Birthday Beer, a.k.a. Shiner 107, a Hoppy Pilsner brewed in celebration of the Spoetzl Brewery's 107th birthday. 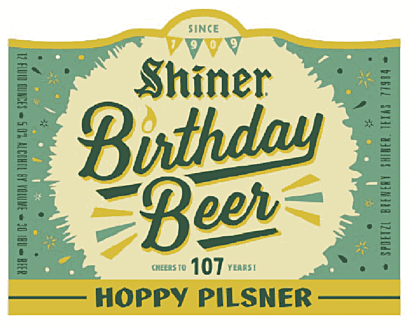 Hoppy Pilsner follows last year's bearer of the Birthday Beer label, Chocolate Stout, and comes just two months after Shiner's introduction of another hop-driven brew in the form of Wicked Ram IPA. The new offering is brewed with German pilsner malt and a combination of Hallertau Tradition and Czech Saaz hops to create a beer that embodies the brewery's cultural roots. As for whether or not the name fits the beer, let me start by saying that the pilsner part of the equation fits rather well. Hoppy Pilsner is light-bodied, dry and refreshing, with bits of crackery malt, a hint of honey-like sweetness and a mix of spicy and grassy hop flavors. Really, outside of a distinct lack of bitterness, the beer would seem to fall right in line with much of what the BJCP considers as standard for the German Pils style. Whether or not it's hoppy, though, probably depends on how you define that particular term. Is it hoppy like an American IPA? Certainly not, but anyone skilled in the art knows that hoppy doesn't in any way equate to a beer being citrusy, piney or bitter. Words like that only describe the characteristics imparted by specific varieties of hops. Hoppy is more about hop presence, and to what degree the intensity of such is a dominant player in the beer. In that respect, you could argue that Hoppy Pilsner is hoppy, since the spicy and grassy components attributable to the hops used are fairly prominent. Still, I wouldn't call the beer hop-forward, as the pilsner malt plays a significant role in shaping the overall character. To me, Hoppy Pilsner doesn't lean one way or the other when it comes to being hoppy or malty. Rather, it's balanced, which isn't at all a bad thing. Maybe it's all just marketing, you know like that whole "session" IPA thing as it applies to an everyday pale ale. I mean, Hoppy Pilsner does sound a lot more interesting than just calling the beer a plain old pilsner. Say that, I suppose, and you start to associate yourself with beers made by the big three. At the end of the day, though, Hoppy Pilsner is just a good basic pilsner, and given the brewery's history and heritage, that's exactly what you'd expect it to be. Availability: Limited in 12-ounce bottles and cans, as well as on tap.